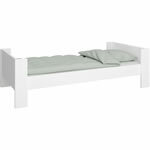 The Steens For Kids pine single bed in a whitewash finish is made from solid Scandinavian FSC certified pine wood and offers a sturdy and modern design. Suitable for extended use the Steens kids single bed is designed for a 90cm wide and 200cm long mattress. Add to the steens single bed frame as your child and family grows with a mid, high or bunk bed extension kit.